Nested at the heart of Marina Reservoir is my favorite weekend hang out venue. The Marine Barrage creates Singapore’s 15th reservoir, making Marina Reservoir the first water catchment in the city centre. 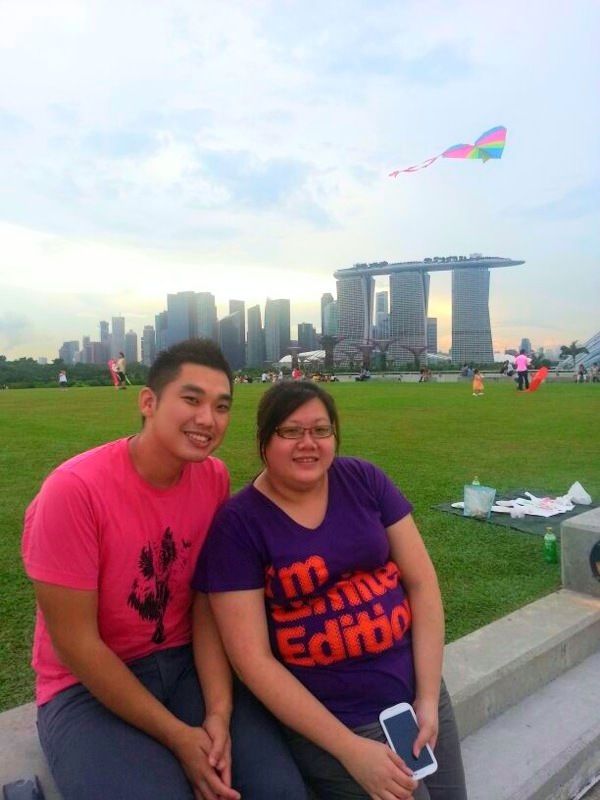 Its quiet corner grands us the magnificent view of the Marina Bay Sands, Gardens by the Bay and Singapore Flyer while we enjoy our picnic and watch children and adults alike attempting to fly their kites. Kite flying is one of my favorite leisure activity and one of the cheapest activities to do on a weekend with friends. Just bring along a kite (which you can get from shops in heartland for less than $5 each), string, ground sheet and a picnic basket and you will be able to enjoy a relaxing weekend. It was partly cloudy we arrived at Marina Barrage around 5pm on Sunday. We attempted a few times to get our kite up but the lack of breeze was not helping. It’s quite strange as usually there are strong winds and it’s effortless to fly a kite there. In the end, we decided to camp at a corner and watch other people (mainly children) running around and trying to fly their kite. While I was busy trying to fly the kite, my friend Kate was secretly getting my birthday cake ready. I knew they were going to celebrate my birthday since this outing was planned weeks but I didn’t expect a cake because I didn’t see them carrying it. One of them must have hidden the surprise inside their large bags! Ming Li was the creative artist behind the self-design cake from Icing Room. Are you able to see the Garfield that she draw? It’s not the best cartoon but brownie points for the effort. I met Kate and Ming Li many year ago while we were all volunteering for Cat Welfare Society. Our common love for cats has been a pillar of our friendship all these years. 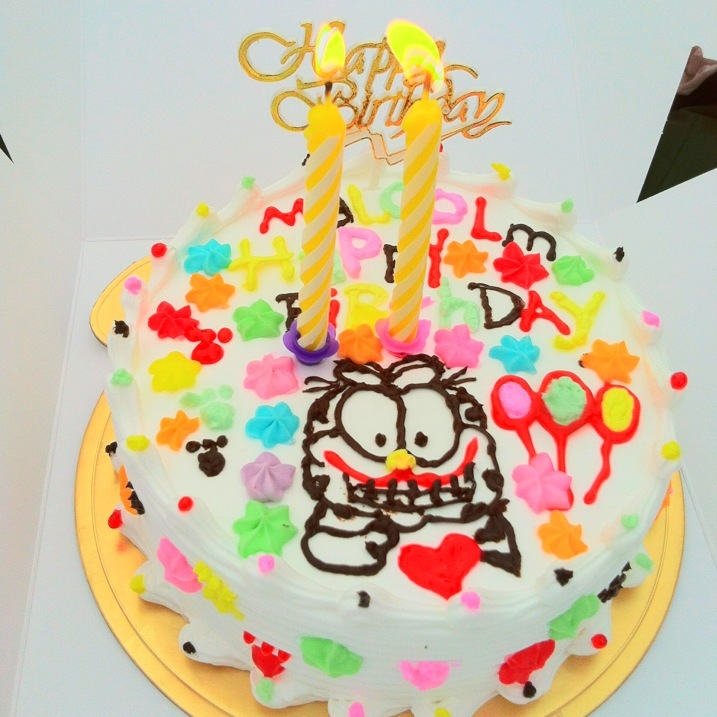 Hence the reason why Ming Li drew Garfield on my birthday cake. A birthday is not complete without getting sabotage from your friends. 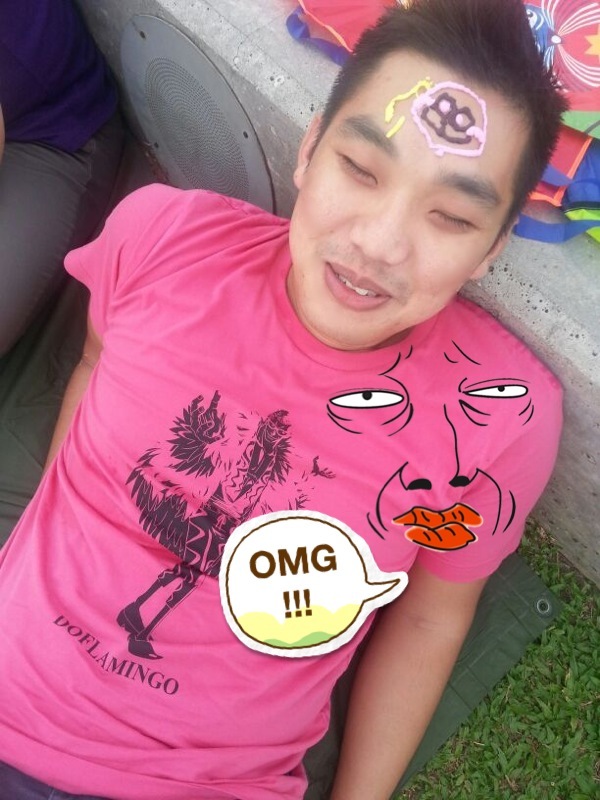 Just when I was not looking, Ming Li ambushed me with the reminding cream. I resigned to fate and surrendered my forehead for her to express her creativity once again. OMG, indeed! If you find the two of them familiar, you may have seen them in my post about our $78 getaway to Batam last year. If not, read about our budget adventure in Batam here. How to get to Marina Barrage? Take the Circle Line or North-South Line to Marina Bay MRT Station. Come out from Exit A, look out for the bus-stop on your left and take Bus 400. Marina Barrage is just a few bus stop away. Our friendly bus driver made an announcement to remind us to get off the bus. This entry was posted in Daily life, Singapore and tagged birthday, birthday cake, cake, cat welfare society, DIY birthday cake, DIY cake, how to get to marina barrage, how to go to marina barrage, icing room, kite flying, marina barrage, marina reservoir, singapore, singapore flyer, single ladies, things to do in singapore, things to do on a weekend, water catchment, where to fly kite in singapore. Bookmark the permalink. Trieste. Napoli. Nespresso. What else?